Vida was born in a small farming village in the Volta Region of Ghana on July 19th 1978, into a family of five children. 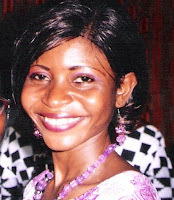 She went to the local primary and secondary school and was later admitted into OLA Senior Secondary School in Ho. She studied Chemistry Biology and Physics as electives for two years, as was the wish of her parents. Her main interests, however, was and has always been creative writings such as short stories and poetry. For that reason, and because of financial difficulties, she left school at the end of her second year. Since the age of 15, Vida has written a lot of poetry and also short fictional stories which she dearly hopes will be published. In this way, she hopes to get the chance to share her passion with the reading public. I think that One Ghana, One Voice is a giant step towards promoting Ghanaian poetry, giving the otherwise hopeless writers a chance to believe in their work and in themselves. May this dream become bigger and may all Ghanaians benefit from this good gesture.